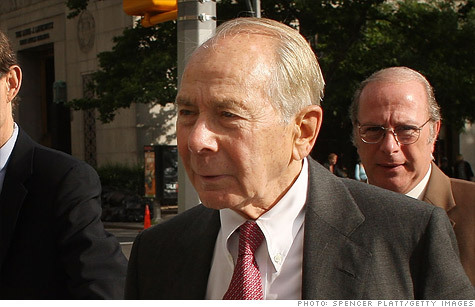 Maurice "Hank" Greenberg is suing the feds for their takeover of AIG, where he was CEO for 40 years. NEW YORK (CNNMoney) -- The former head of the American International Group sued the U.S. government for $25 billion on Monday, claiming officials should have bailed out AIG instead of taking it over. Maurice "Hank" Greenberg and his Starr International Company accused officials of discriminating against AIG. "The government is not empowered to trample shareholder and property rights even in the midst of a financial emergency," Starr alleges in the lawsuit, which was filed in the U.S. Court of Federal Claims in Washington, D.C.
Starr also sued the Federal Reserve Bank of New York in federal district court in Manhattan. A top Treasury Department official denied Starr's claims. "It is important to remember that the government provided assistance to AIG -- and stopped it from collapsing -- in order to prevent a meltdown of the entire global financial system," Tim Massad, assistant secretary for financial stability, said in a statement. The New York Fed released a statement saying that the allegations have "no merit." "AIG's board of directors had an alternative choice to borrowing from the Federal Reserve and that choice was bankruptcy," the New York Fed said in the statement. Starr, based in Switzerland, says it was the largest AIG shareholder at the time of the government's takeover in September 2008, at the peak of the financial crisis following the collapse of Lehman Brothers. Starr accuses the government of seizing an 80% interest in AIG's common stock and then using the insurer as a vehicle to provide "backdoor bailouts" to other companies. This was after the government denied AIG the loans and other forms of assistance it was providing to other firms. "Rather than granting AIG the same access to liquidity assistance that it granted to numerous other institutions, including various foreign companies, the government instead chose to use the difficulties faced by AIG to implement a takeover of the company without just compensation," according to the suit. Greenberg became AIG's chief executive in 1968, a position he held until his retirement in 2005. Under his watch, the company grew to 97,000 employees and more than $40 billion in annual sales. But the company also got involved in mortgage-backed securities and collateralized debt obligations, risky markets that became toxic when the housing bubble burst. In 2008, AIG went into a nose dive when it lacked enough liquid assets to cover the increasing demands for collateral, but other companies were in the same boat. Starr's suit says that the U.S. government provided $110 billion in loans to those other companies.